The everday happenings of Yoshi, Cody, and their humans. And is helping us post for a change! We are still alive but Mommy has been doing a lot on the computer recently. She has to talk in front of a lot of people this Wednesday and is very nervous! She has been working on her presentation almost non stop for the last week. When she has stopped, she's been working on studying for some big test she has to take in March over everything she has learned over the last 2 years. Hopefully this explains why we haven't posted much recently - she's been hogging the computer! Mommy recently gave me my first blueberry - I didn't care for the taste but it was fun to play with! And here is a video of Cody playing in the snow that we had back in January. Your moma has good reasons to procrastinate. Lucky for us, and you, that you were the alternative! It's nice to see you ... and nice to be back. Once this old snow melts, we'll be ready for a nice fresh one! Good thing you're all back. Your mom deserves a big rest and playtime with you, Yoshi, to ease the stress. LOOK AT ALL THE DOGS with MOMMY! YOSHI is a DOERING eith SCHAR! YOSHI is YEMEN - OSIRIS! COULTER is a PANN in NICE! ROCKY- PR- nails CROW- JAGGER- LADD- STING- REGUSLO! 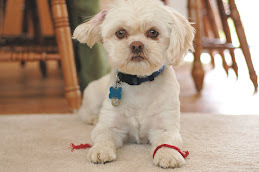 I'm a 3 year old Lhasa Apso/ Shih Tzu mix (we think). I enjoy looking out windows, licking drippings from the bathtub, playing with socks, and chewing on Cody's ears. I don't like greeting cards that make sound, having to go to bed in my kennel after I've fallen asleep on the couch (but I bark in the middle of the night, so I have to), and swallowing pills. Yucky! 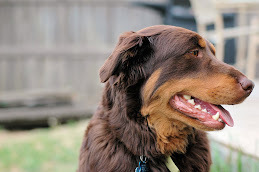 I'm a 2 year old Chesapeake Bay Retriever/Australian Shepherd mix. I love getting attention of any sorts, going to the dog park, playing in the swimming pool, destroying any non-Kong toy brought into my house, chasing balls, and bothering Yoshi. I don't like it when mommy and daddy fold laundry (I run downstairs until they are done), also not a fan of the greeting cards (Yoshi is too scared to stay there with me so I get scared too), and when Yoshi attacks me for no good reason. He can be a meanie!